We are happy to announce the availability of Open vSwitch 2.5 (OVS) for Microsoft Hyper-V Server 2012, 2012 R2 and 2016 (technical preview) thanks to the joint effort of Cloudbase Solutions, VMware and the rest of the Open vSwitch community. The OVS 2.5 release includes the Open vSwitch CLI tools and services (e.g. ovsdb-server, ovs-vswitchd, ovs-vsctl, ovs-ofctl, etc. ), and an updated version of the OVS Hyper-V virtual switch forwarding extension, providing fully interoperable GRE, VXLAN and STT encapsulation between Hyper-V and Linux, including KVM based virtual machines. As usual, we also released an MSI installer that takes care of the Windows services for ovsdb-server and ovs-vswitchd daemons along with all the required binaries and configurations. Windows Server and Hyper-V Server 2012 and 2012 R2. Windows Server and Hyper-V Server 2016 (technical preview). Windows 8, 8.1 and 10. Click “Next”, accept the license, click “Next” again and you’ll have the option to install both the Hyper-V virtual switch extension driver and the command line tools. If you want to install only the command line tools (in order to be able to connect to a Linux or Windows server), just deselect the driver option. Click “Next” followed by “Install” and the installation will start. You will have to confirm that you want to install the signed kernel driver and the process will be completed in a matter of a few seconds, generating an Open vSwitch database and starting the ovsdb-server and ovs-vswitchd services. The installer also adds the command line tools folder to the system path, available after the next logon or CLI shell execution. Let us assume that we have the following environment: a host with four Ethernet cards in which we shall bind a Hyper-V Virtual Switch on top of one of them. Create a Hyper-V external virtual switch with the AllowManagementOS flag set to false. PS C:\package> Get-VMSwitchExtension -VMSwitchName vSwitch -Name "Cloudbase Open vSwitch Extension"
PS C:\package> Enable-VMSwitchExtension -VMSwitchName vSwitch -Name "Cloudbase Open vSwitch Extension"
Please note that when you enable the extension, the virtual switch will stop forwarding traffic until it is configured (adding the Ethernet adapter under a bridge). Let us talk in more detail about the two commands issued above. will allow the bridge to use the actual physical NIC on which the Hyper-V vSwitch was created (port1). Users from Linux are familiar with the setup above because it is similar to a linux bridge. We currently support a single Hyper-V virtual switch in our forwarding extension. Multiple host nics with LACP support is experimental in this release. 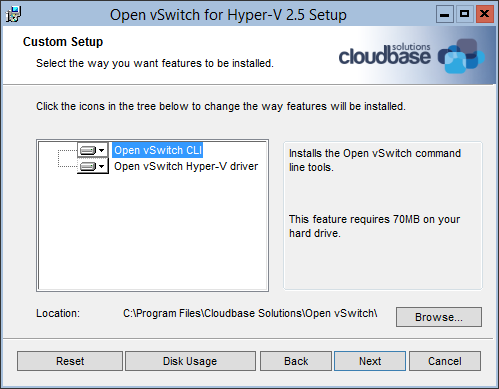 OpenStack is a very common use case for Open vSwitch on Hyper-V. The following example is based on a DevStack Mitaka All-in-One deployment on Ubuntu 14.04 LTS with a Hyper-V compute node, but the concepts and the following steps apply to any OpenStack deployment. After DevStack finishes installing we can add some Hyper-V VHD or VHDX images to Glance, for example our Windows Server 2012 R2 evaluation image. Additionally, since we are using VXLAN, the default guest MTU should be set to 1450. This can be done via DHCP option if the guest supports it, as described here. Full steps on how to install and configure OpenStack on Hyper-V are available here: OpenStack on Windows installation. This is the internal adapter bound to the vSwitch virtual switch, as created during the previous steps (ovs-vsctl add-br br-port1). Next we can disable the Windows Hyper-V agent, which is not needed since we use neutron Open vSwitch agent. Note: creating a service manually for the OVS agent won’t be necessary anymore starting with the next Nova Hyper-V MSI installer version. PS C:\Users\Administrator> Get-VMByOVSPort -OVSPortName "f44f4971-4a75-4ba8-9df7-2e316f799155"
The VM instance-00000003 got an IP address from the neutron DHCP agent, with fully functional networking between KVM and Hyper-V hosted virtual machines! This is everything you need to get started with OpenStack, Hyper-V and OVS. In the next blog post we will show you how to manage Hyper-V on OVS without OpenStack using a VXLAN tunnel.